Though HuberResidents.org is a website I've set up to talk about local politics and community, I generally don't talk specifically about my campaign here. These past couple days the site is getting a lot of hits from people looking for my campaign site. You can find that at http://TomMcMasters.us. However, if you really want to get to know my personality, spend an hour on this site. Election day is Tuesday, November 5th. Polls are open on Election Day from 6:30 a.m. to 7:30 p.m. 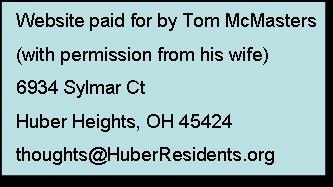 This election Huber Heights has two contested races; Mayor and Council at Large. There is also a Huber Heights City school levy on the ballot in Montgomery County. There are Bethel Twp, Pleasant Hill/ Newton Twp Fire,Troy-Miami Library, and Forest Hill Cemetery Levies in Miami County. Hope I got them all but I only looked up a couple of addresses of friends of mine. Check your own using the Cox Media group voters guide that contains information on all the Huber Heights candidates and levies. Note: If you use the online Cox Voters guide don't click on the article links. This takes you out of the guide into the newspaper and you'll lose all the good features of the guide. The good part about Wednesday is that I'll have time to write again. Last week I was sent the 2003 Ordinance that set up the original Montgomery County TIF district. 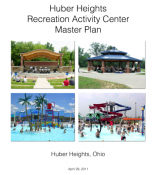 This is a 30 year TIF and the Huber Heights City Schools only get 25% of what they normally would get. But the language in this ordinance is very confusing. In fact, Montgomery County distributed the money wrong at first and the school was on the short end of the audit and ended up having to give the city $283,000 because of Montgomery County's mistake. I suspect this is one of the reasons the school district doesn't challenge the city more vigorously when they set up TIF districts. I also received the 2005 Ordinance that set up the Miami County (Carriage Trails) TIF. Here the Bethel Schools receive all (100%) of what they normally would get. The recent Alcore, Family Dollar and Trimble TIF ordinances are online at the city's website. The Bethel and Huber Heights City Schools only get 30% of what they normally would get in each of these. Can't wait to write more later in the week. Congratulations Tom on a campaign well done. Now the work starts and I am looking forward to some new directions within the city. We need to change some of the old ways the city has operated in the past and NOW is the time….A lot of transparency will go a long way in the eyes of the public, more public awareness opportunities on issues and an open door policy to discuss issues. And the biggest thing, is to move all committee meetings into the council chambers where there is more room to accommodate the public that needs to get energized to get informed, educated and enlightened on all aspects of city government. Congratulations. Talked to you last night. I remember years ago getting elected in local union politics both at the Executive(business) Committee and later as leader of the group where I was employed. What kept me elected was I was completely honest with everyone. I never lied and I never hedged the truth. It is tempting to do so at times. I always did my homework. I had a group of people advising me that had done the job I was in and I took their advise on most issues. I once got the numbers wrong on a foreman's dues. It was a matter of a few cents. I went to him and reimbursed him the difference even though it was embarrassing to get the numbers wrong. That was the the reason. I might not be the greatest brain out there, but I was always totally honest with my people. Our Union covered both our immediate bosses and the workers. Some resented us covering the bosses. But I treated everyone fairly when I was in office. Do the same as I did and you might have a long career. This was one of the closest elections that I can remember. You will need all the support you can get. Consider me one of those supporters. Congratulations hope you remember me. CONGRATULATIONS MAYOR MCMASTERS!!!! WELL DONE!